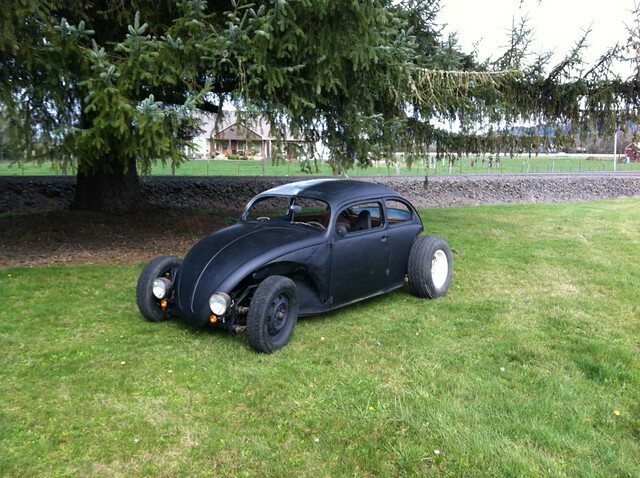 I been browsing the forum for a while and finally have a project to call my own and thought this community would be a good place to show my build. 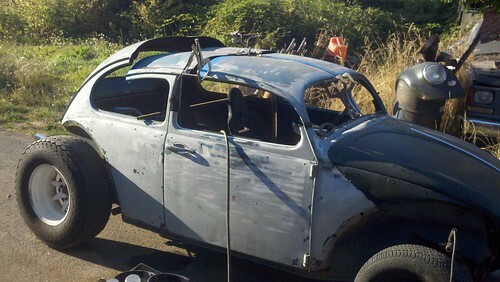 I just got a FREE 75 VW pan with a 66 body and 67 1500cc engine. 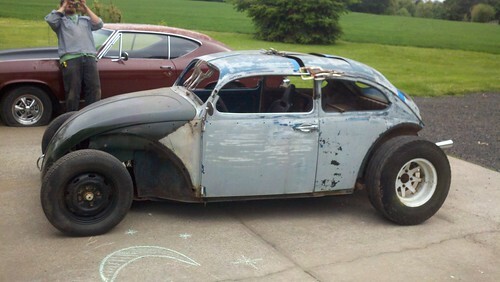 My brother in-law gave it to me and we are turning it into a Volksrod. So here we go! Last edited by pdxvw; July 11th, 2011 at 10:16 AM. Well we started the project this last Sunday. 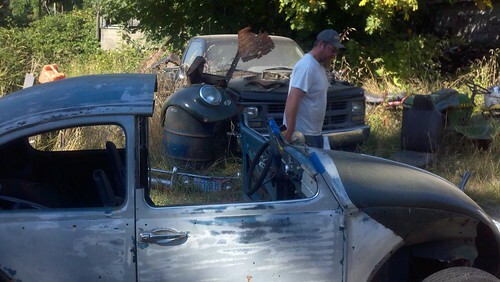 My wife helped us pull it out of the field that its been sitting in for the last 12 years with her Jeep. Then came the process of getting the motor running. 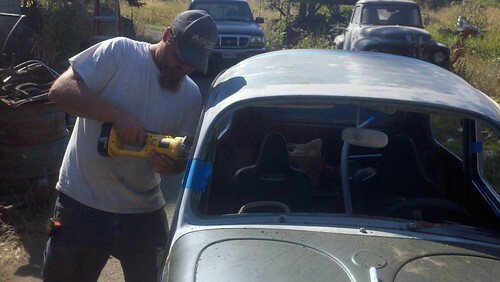 Thankfully my brother in-law Brian has some other VWs we were able to steal some parts off of to get it running. We also went to the Rickreall Swap Meet and found a nice aluminum shifter and exhaust system. 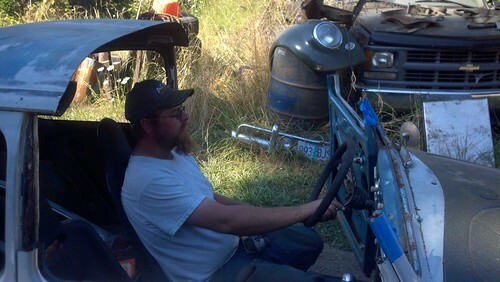 After we got it running Brian mounted the front end. Still need to find a front clip or cut one off of the others. Last edited by pdxvw; June 6th, 2011 at 03:51 PM. 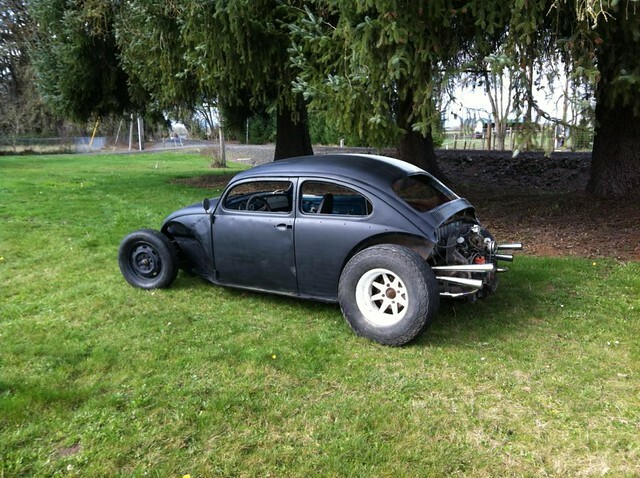 Got to work on the Bug a bit more today. Did an oil change and changed out the screen. VERY dirty! Also changed out the spark plugs, plug wires, and voltage regulator. 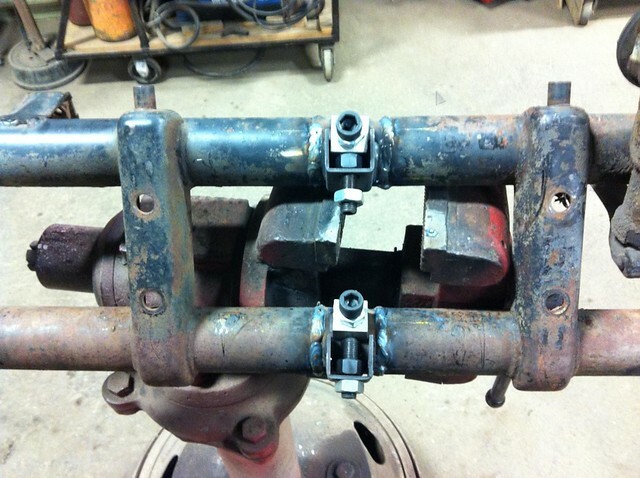 Working on some brake parts so we can actually drive it around and not have to use the e-brake to stop. 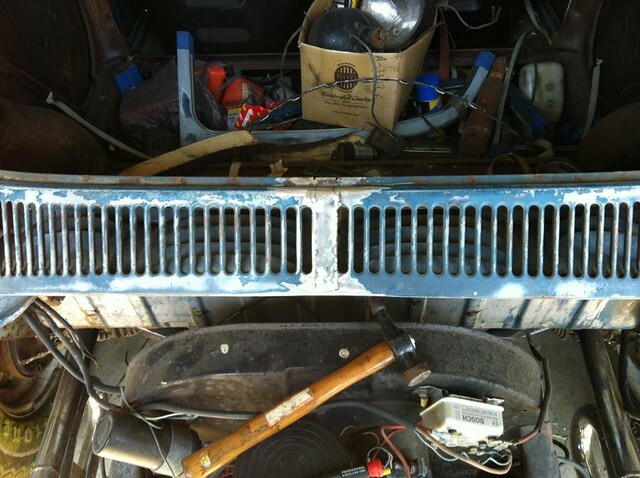 Ordered up a set of floor pans from JC Whitney today as well so next weekend they will be going in. One stop closer to driving condition. Well the floor pans aren't going to be here until this next week apparently so maybe next weekend they will be going in. 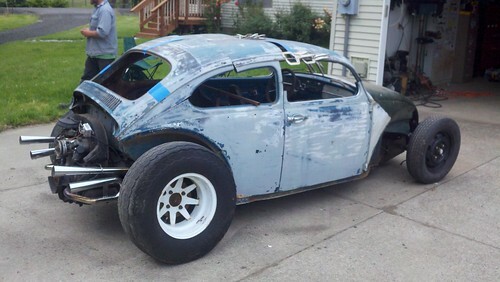 That didn't stop the build for the weekend though. Today we removed the body from the pan, and cut out the floor. 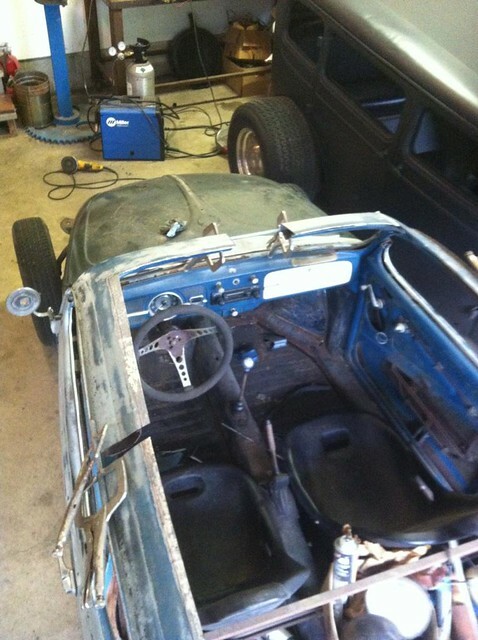 We also removed some of the Torsion springs and hopefully lowered the front end. Not sure how much though since the body won't be going on for a while. 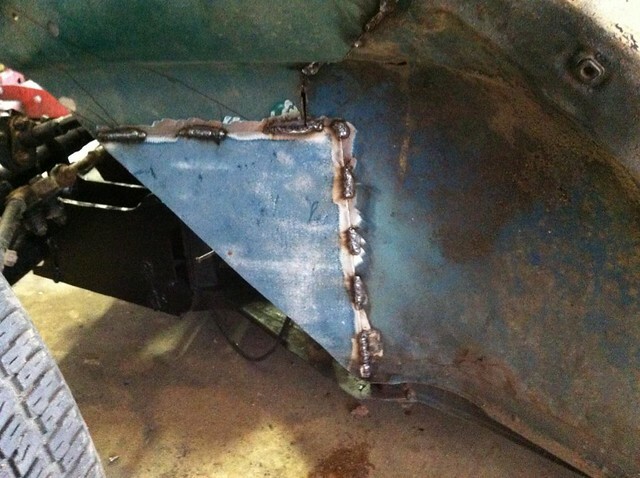 The next project was hooking up an actual fuel line to where a tank will eventually be. 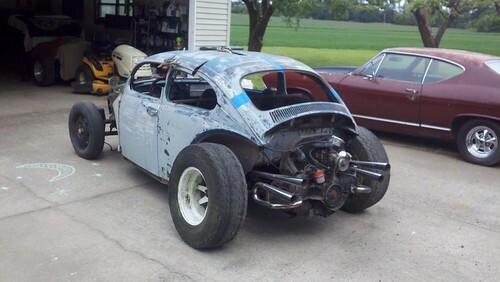 Getting closer to a driving chassis! 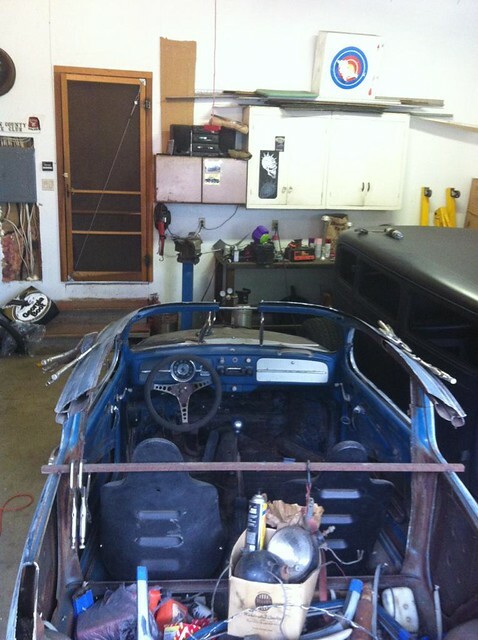 Just needs the floor pans so we can plumb the brakes and get it one step closer to driving. Got some more work done this weekend and remembered to take some pics! 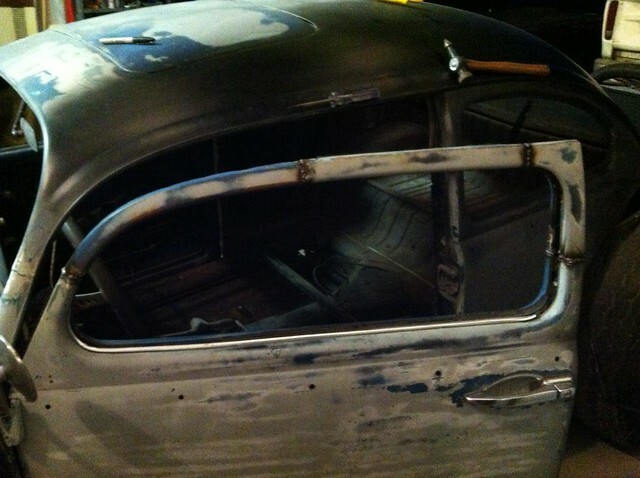 Last week end we got the floor pans mounted and the body sitting on the pan. Unfortunately we had to get creative with mounting the body since there was a fair amount of rust on the bottom of the body. 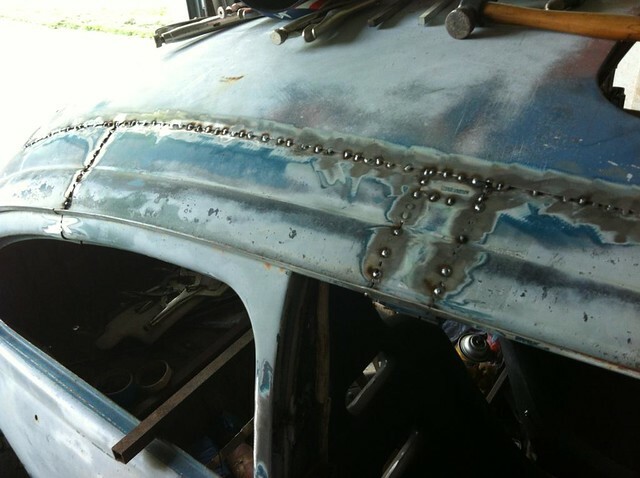 Thankfully Brian had some good ideas on how to weld in the body. So now we wont be removing the body again. We also had to cut out a section from the door molding and weld it in since it was so rusted that we couldn't even weld on it. 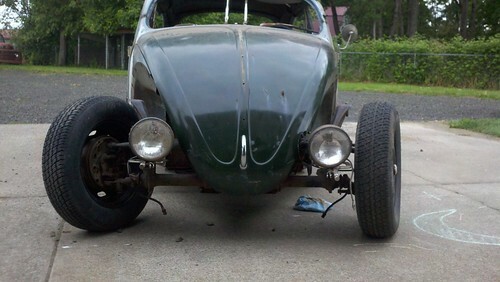 Also sand blasted and painted the front wheels, routed the brake lines, and replaced some missing brake hardware. 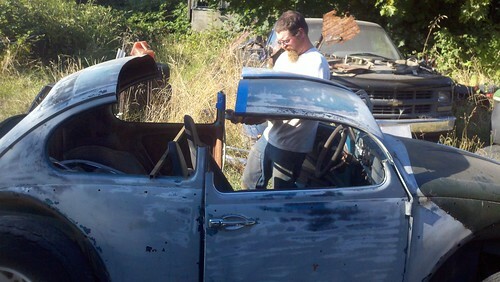 So after the body was mounted it was on to get her running again. Brian noticed that earlier we had mounted the exhaust upside down. It never looked right but with more room to work after trimming the body it makes more sense now. So now it runs and drives. The speedo even works! 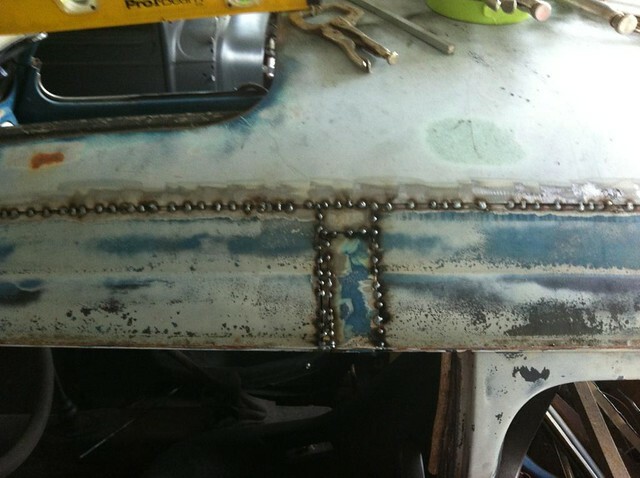 Next up is securing the front end and adding a brake reservoir so it will stop when needed. Oh and a proper gas tank might help as well. The cranberry juice jug is OK, but probably wont pass any inspections. Well, its been a while since I've been on here. The end of summer got very busy and then my daughter was born and working outside in the winter in Oregon isn't much fun. So enough with the excuses, on to the updates! We mounted the brake fluid reservoir using a Mercedes brake fluid container as the mount, and mounted a proper gas tank. 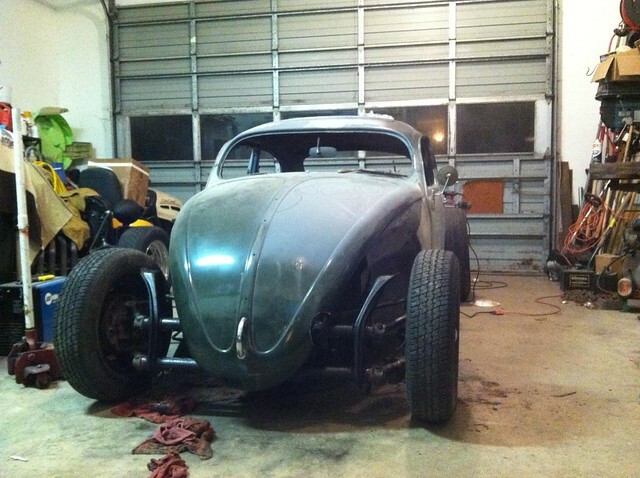 We also cut off the front half of another Bug to weld on and make the front clip complete. 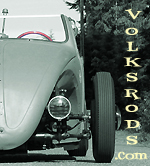 We also lowered the rear suspension. It is now sitting on the bump stops. 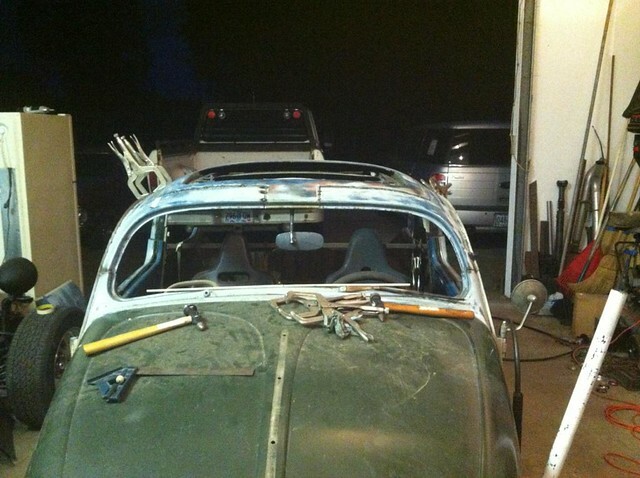 The next project was chopping the top. We are doing a 4 inch chop. Neither of us has done this before so we are learning as we go. Petty fun so far though. Got the beam extension mounted this last weekend. Its a 10 inch extension with a 2 inch drop and about 2 deg of caster built in. 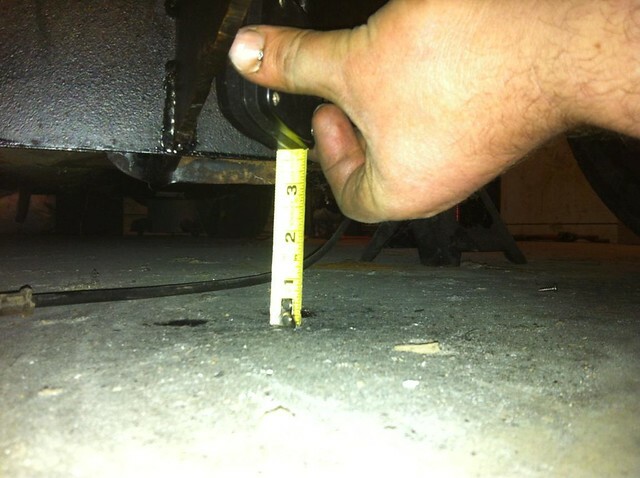 In this photo we have the suspension compressed to show what a 4 inch drop would look like. I think it needs to be lower. Here it is with the front headlights mocked up. Side profile. the beam extension is most noticeable in this pic. A nice twist with the extension it that the speedometer cable still works and the brake lines still work with out having to swap to longer units. 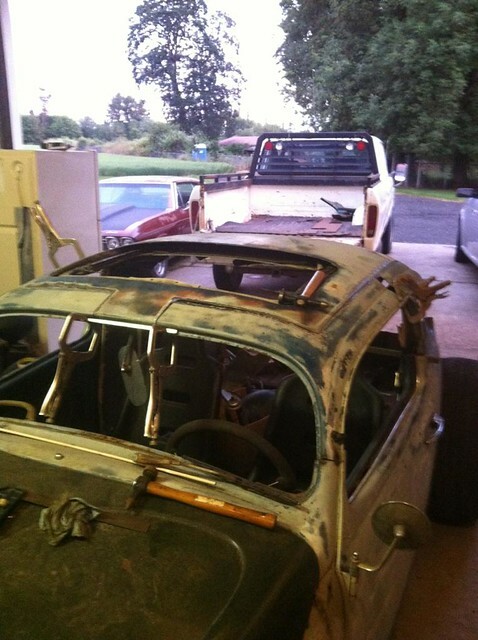 Now to get the steering back together and weld up the top and we will almost be "done." This a lot of fun to drive. 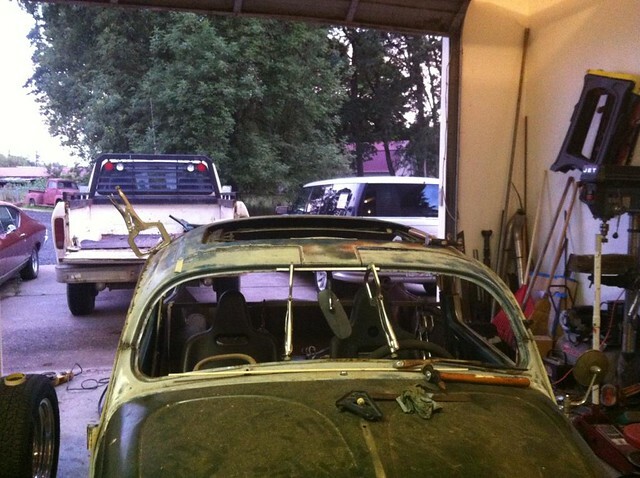 The car trailer was in use a couple weekends ago so I drove it down the road a couple miles with no brakes, windshield, lights or license plates to get it to the other shop to finish working on it. 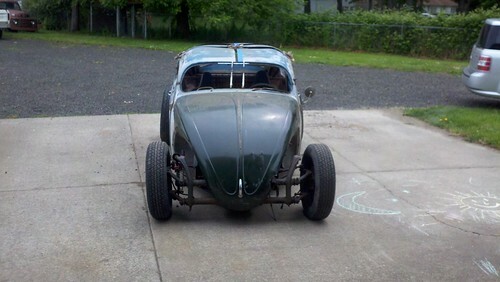 Hope to have it fully legal this summer. Well, its been a while but here are some more pics of the progress!